The winter market on the square outside Vienna’s giant Ferris wheel is sort of a Christmas market. And sort of a New Year market. But actually neither. It’s more of a gathering point for chasing away the winter blues with a glass of something alcoholic. If you imagine a Christmas market and take away everything but the food and drink stalls, then throw in music and dodgems, you’ve pretty much got the Wintermarkt am Riesenradplatz. It’s a little more down-to-earth than its seasonal siblings nearer the city centre. More rock and roll than Silent Night. A pint of ale to the others’ glass of Chardonnay. The square in front of the giant Ferris wheel is a welcome area to the Prater giant funfair and ringed by restaurants, shops and entertainments. In December, it fills with stalls and bar tables, with pop and soft rock piped in over the loudspeakers. Around 20 stands sell a mix of traditional winter market fare and more usual snacks and drinks. So you’ll find all the weird and wonderful varieties of punch, plus Glühwein, Schnapps, and hot chocolate, but also beer and wine. Waffles, oven potatoes, crepes and spätzle, langos, roast chestnuts and chocolate-covered fruit, but also pizza, chips and toasted sandwiches. In the spirit of the Prater, the Wintermarkt distinguishes itself through more “action”. For example, there are usually live acts every Thursday, Friday, Saturday and Sunday from 7 pm, featuring a range of musical styles: Austropop, funk, soul, blues, gospel, rock, etc. The location also means there’s plenty else to do once you’ve eaten your waffle or toasted the season with a mug or glass of the good stuff. In 2018, for example, the square itself had a carousel and a mini train that took you through the Prater (both require tickets). The Chocolate Museum and Madame Tussauds are both on the square, too. Some Prater rides also remain open through winter, such as the bumper cars. Not to mention the giant Ferris wheel itself, which looks wonderful at night. In 2018, there was a circus tent on the adjoining meadow, which had bubble shows in November, then a traditional circus through to January. On New Year’s Eve, there was a DJ from 8 pm, live music from 10 pm, and a 10-minute synchronised firework and music show at midnight. Is it a place to soak up the Christmas atmosphere? Nope. Is it a place to warm yourself with snacks and drinks while the kids have fun? Yep. 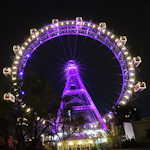 The Prater and the square are just a short walk from the Praterstern subway station (look for the giant Ferris wheel when you exit the station – it’s impossible to miss). The station is served from the centre by the U1 and U2 subway lines. Trams 5 and O also stop there, as do the bus lines 5B and 80A. Praterstern is also a station on the S1, S2, S3, S4 and S7 city train lines.